Jon Hyers's Outrageous-Media Company. PROFX PROJECTOR WITH TWOEXTRA FX Assortments. [YES this includes a projector]. Note: There are a few similar FX between the normal USB that comes automatically with the PROFx projector and the download pack. It's too time consuming to avoid this, The Carolers are in two places [usb and download], and the Zombies and Ghouls are similar, but what comes in the halloween download pack is the Newest Upgraded versions, where the characters Break Out Glass Windows, the USB drive has a NON glass version. 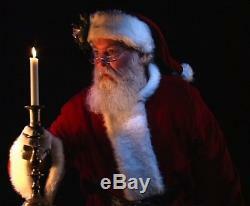 Santa is a different version in the downloads, in fact two different versions, and the rest of the files are NEW to you. UK CUSTOMERS, OR EUROPE CUSTOMERS. We have given NO RESALE CONTRACT TO THE UK, though we have offered them to stores who were NOT interested. 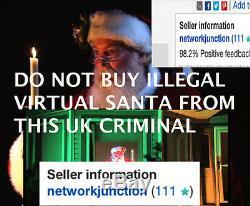 Some of these Men [usually] are so desperate to make cash by breaking the law, they will sell it for much cheaper and it's not worth it to YOU or THEM. ALl of these listing so far DO NOT carry the official youtube from my company and of course you have NO idea what you are getting. You don't want to be in possession of these files, from their computer. EXTRA FILES ARE DIGITAL DOWNLOAD, NOT A DISC. It's very important you understand how the process works. BE SURE TO READ THIS!! 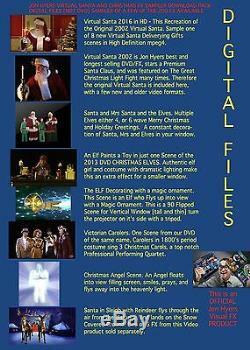 BELOW IS THE ORIGINAL VIRTUAL SANTA DEMO, THIS SANTA COMES IN THIS BARGAIN PACK AS DIGITAL FILES. BELOW: JON HYERS IN STUDIO, AFTER A HARD DAYS WORK!!! RECEIVING THE FILES [UPDATED OCT 25TH 2016]. I will also send you the link from ME, so you get it twice. I TRY to get it to you as soon as possible. If you have a heavy-superactive spam filter, you won't get the link. This system works very well because PAYLOADZ is the server behind our Self Service Shopping on Digital Download at VirtualFXVideo and Virtualsantaandme. We sell 10,000+ Downloads per Year, and 99.9% of the time they work. If you have a really rotten computer, or internet service you won't get the files. I cannot guarantee ANY of this SUPERSTRUCTURE of the web - etc, but I will send the files and can PROVIDE PHOTOGRAPHIC SERVER RECORDED PROOF I SENT YOU THE FILES LINK. And when it happens, "Things Don't Work". You MUST contact me directly to get help with any file issues. WHEN YOU GET THE FILE LINKS. Try downloading 6 at a time, then more after that. Some computers can't handle more than that. If the links expire I can send it again. The links are supposed to remain active for a few weeks. But that is no always the situation. I'm happy to help, don't make extra work for me, when all you need do is talk to me directly, ok? 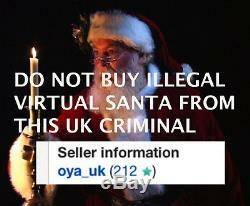 The item "VIRTUAL SANTA PROFX1 VIDEO PROJECTOR AND HOLIDAY FILES DOWNLOAD1, JON HYERS" is in sale since Saturday, November 19, 2016.